As The Crossover's 1-on-1 Tournament reaches another round the competition heats up once again. This time we have Stephen Curry vs. Kevin Durant. 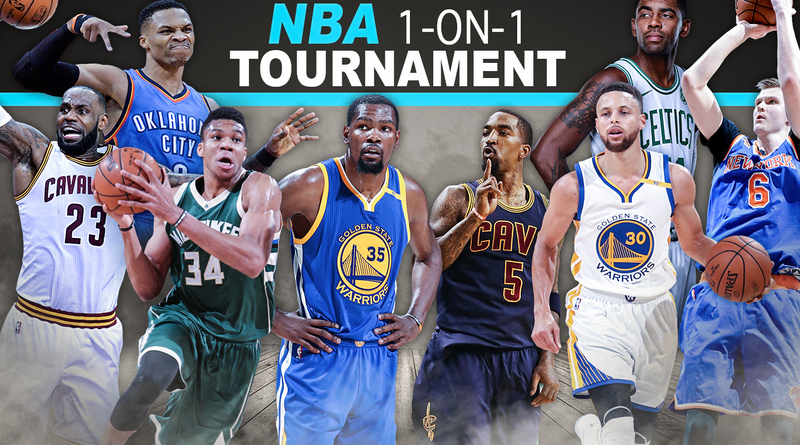 The Crossover’s quest to crown the NBA’s best 1-on-1 player continues, as our fan-voting-fueled 1-on-1 tourney hits the Round of 8. The previous round saw some ridiculously close battles, with Kyrie Irving squeaking past Jimmy Butler by a handful of votes, and Giannis Antetokounmpo pulling off an 11th-hour upset against Anthony Davis. The matchups only get more difficult in this round. Who will make it to the final four? Only you can help decide. Bron cruised through his second round matchup against John Wall, but now he finally has to take on someone his own size. Giannis has the length and athleticism to disturb James, but he won’t have an easy time getting to the rim on offense. I’m not sure how either player plans to score in this matchup. This one should be a slugfest. Kyrie is an offensive savant, but Melo’s been getting buckets for his entire life. Whoever holds up even the slightest bit on defense will give themselves a much better chance to win. Uncle Drew will definitely find ways to slither into the paint to unleash buttery layups. On defense, however, Irving will have a tough time slowing down Anthony once Melo sets up from the elbow. Anthony also has the added motivation of avenging his good friend James, who Irving has seemingly been out to destroy this summer. There’s a lot on the line here. The most important Warrior vs. the Finals MVP. Steph’s shooting ability changed the landscape of the NBA. Durant’s addition to the Dubs has given them the potential to become one of the league’s greatest dynasties. Durant’s size has given him a comfortable edge in every matchup so far in this tournament, and it should help him again here. How will Curry slow him down? On the other hand, Steph has proven he can score against anyone, and if Durant gives him an inch of space, Curry won’t be afraid to launch. Both players would weirdly have a lot to prove here. That Steph is still sometimes doubted as a true superstar after becoming the NBA’s first unanimous MVP is insane. And Durant has (sometimes hilariously) dealt with critics from the moment he decided to leave Oklahoma City. Maybe battling head-to-head will convert some of the non-believers. Both Kawhi and Russ have been dominating their way through this tournament, and now they square off in the third round. Should Kawhi have been MVP? Maybe his snub from the season’s top award provides him enough motivation to take down his fellow Jordan Brand endorser. Leonard certainly has the upper hand defensively in this matchup, but Russ is relentless, and you have to think eventually he’ll start muscling his way to the hoop. This could be the closest call of Round 3.